Jez Grand Coulee (ang. Grand Coulee Dam) je velik gravitacijski jez na reki Kolumbija. Nahaja se v zvezni državi Washington, ZDA. Uporablja se za generiranje elektrike in namakanje. Gradnja se je začela leta 1933, odprli so ga leta 1942. Leta 1974 so dogradili še tretjo elektrarno in tako povečali kapaciteto. Grand Coulee je s 6,8 GW največja elektrarna v ZDA. ↑ "Renewable Energy Sources: A Consumer's Guide". U.S. Department of Energy: Energy Information Administration. Pridobljeno dne 28 January 2014. 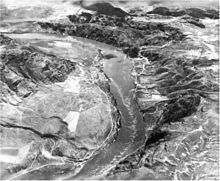 University of Idaho Libraries Digital Collections – Dam Construction in the Pacific Northwest Photographs of the construction of the Columbia Basin Project, with a special emphasis on the construction of Grand Coulee Dam. 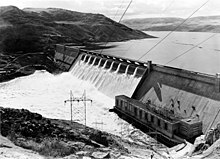 University of Washington Libraries Digital Collections – Grand Coulee Dam Photographs and pamphlets of the construction of the dam. Includes information about the recommendations for and against building the dam as well as images of land clearing activities by the Public Works Administration. Čas zadnje spremembe strani: 16:44, 20. januar 2017.